A versatile bike that is ideal for short and long weekend rides is the Btwin Riverside 100 hybrid cycle. This Btwin bicycle by decathlon is perfect if you are looking for a companion that lets you switch between roads and trails without missing a beat. Belonging to the Riverside family, the Btwin Riverside 100 comes with a unisex bicycle frame, single-chainring 6-speed drivetrain, V-Brakes and 700 C tyres. If you’re low on a budget and are looking for a geared bicycle that offers a smooth riding experience on city roads, the Btwin Riverside 100 hybrid cycle should be on your list. As we go low down the order, the decathlon bicycle frames shift from alloy to steel frame. The same is observed when you look at the Btwin Riverside 50 hybrid cycle. Steel makes the frames a bit heavy, however, they are very durable. It can ding, scratch, dent, even bend, and retain structural integrity. Similar to the other Btwin Riverside cycles, the frame offers a low geometry that makes it easy to get on/off the bike. The Btwin Riverside 100 hybrid cycle is also equipped with a Semi-raised handlebar (620 mm) Height-adjustable stem, 70 mm long 1-1/8″ headset. 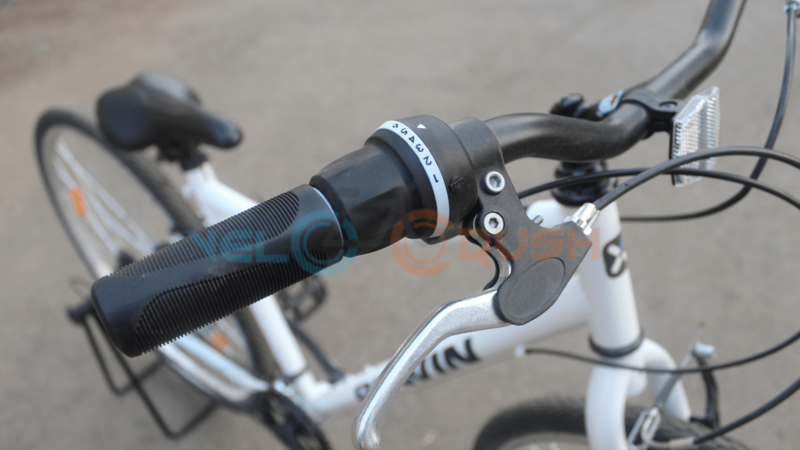 The stem and handlebar are welded together as a single piece for greater security. However, we believe this is about reducing the cost of manufacturing. 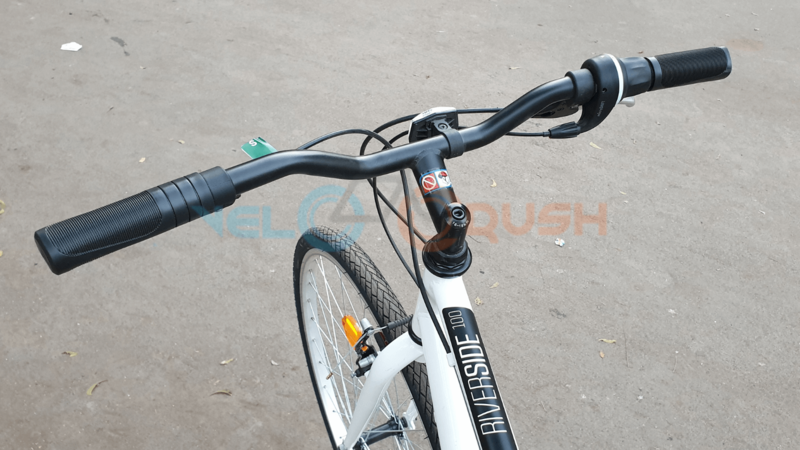 The Btwin Riverside 100 hybrid cycle comes with basic grips that offer decent padding and vibration damping to keep hands comfortable. However, they are not suitable for extremely long or bumpy rides. As a low-end entry-level hybrid bicycle, there’s not much you can expect from this geared bicycle. Equipped with 6 indexed speeds with B’Twin by Microshift grip shifters, the gears work pretty well for beginners. The chainring comes with a 38 teeth cog supported with 14 / 28 that makes it easy to ride on flats as well as uphill. 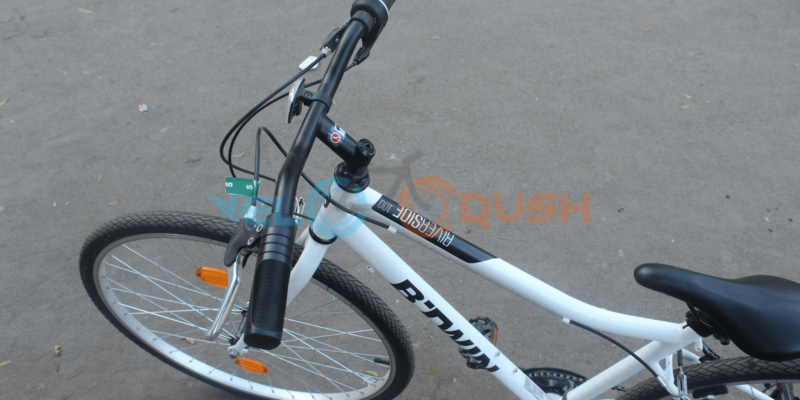 The Btwin Riverside 100 comes with plastic brake levers and steel front/rear V-Brake brake. These Indian brakes are pretty decent and get the job done. However, after a certain period of usage, a slight squeaking noise is common. At times, the brakes might even rub the rim while turning. This only means that you will have to check the alignment of the wheel as well. The Btwin Riverside 100 hybrid cycle comes with single-walled rims that are decent for city riding. With these wheels, you can’t afford to hit potholes or ride on very bad road patches at a higher speed. These single-walled wheels aren’t durable and surely can’t take the beating. So make sure you avoid potholes and bad road patches. The only advantage as compared to double walled rims is that they are way lighter. 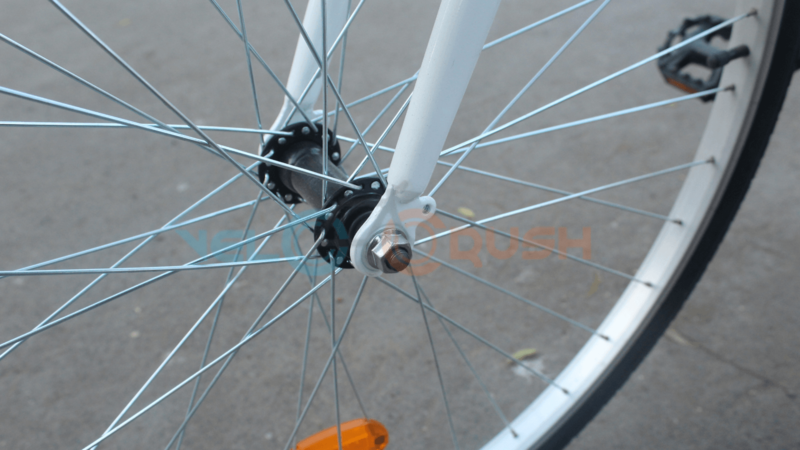 Most of the brands that manufacture bicycles within INR 10000 come with single-walled rims only. The rubber tyres at 700 x 35 offer a decent enough grip on any kind of road surface. On the overall, the tyres roll really well and last long. The low end of the Btwin Riverside hybrid cycle comes with a decent seat that is not too comfortable for those looking to get back to cycling after long. However, after a few rides, you get used to the saddle. If you still find it uncomfortable, ensure you buy a gel pad or padded shorts that are worth spending on. 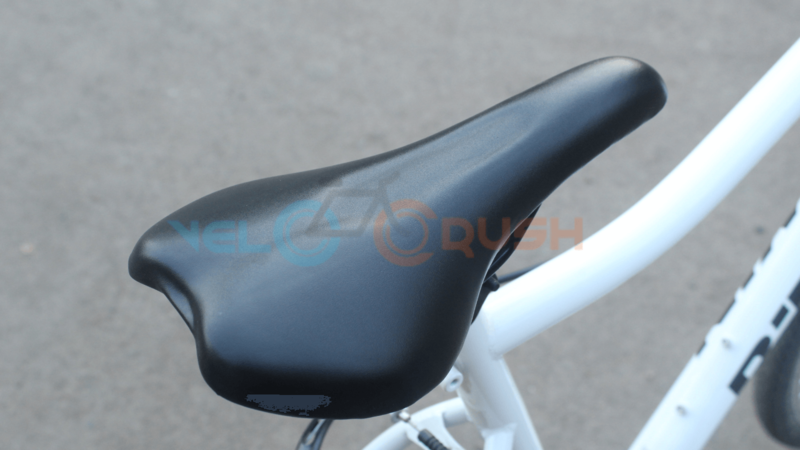 Replacing the bicycle saddle with another one might just be too expensive. Expecting a suspension fork on a bike with such a low budget is certainly a bad idea. However, decathlon’s technical team has done a good job by offering a rigid steel fork (1-1/8 threaded pivot) that is sturdy while climbing, descending as well as on flats. It has the ability to take away the chatter and make riding fun. If you are thinking of going off-road with this fork, it’s probably a bad idea. 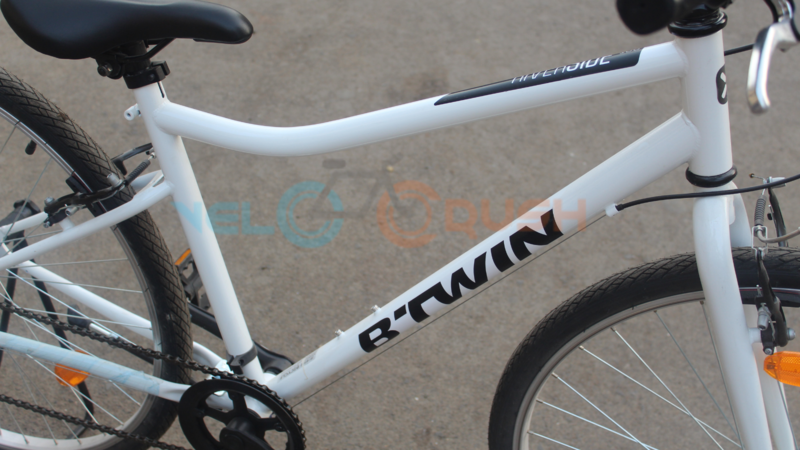 After the Btwin Riverside 100 hybrid cycle review, we felt the bicycle is worth the money. It certainly does offer a smooth riding experience on city roads.